This franchise is the biggest in the pizza market. Domino's, one of the best known and popular brand both internationally and nationally, makes it easier for you to enjoy your parties at home by ordering pizza. Now make your party more lively, more chirpy and more tasty with a cheesy tasty pizzas. This pizza place caters other yummy food as well like garlic breads, pastas, desserts, sandwiches and more. They are known for their hand-stretched pizza base, tasty choco lava cakes, filling sandwiches and farm fresh salads. Another USP of this amazing pizza place is that they give the best of the best promo codes. You can buy one and get another for FREE or get flat 50% off and all these are everyday deals. So hurry - order your pizza online today. Flat 30% cashback on pizzas. Make the payment using Pockets to enjoy 20% cashback. 2 medium pizzas worth Rs 305 at just Rs 199 each. Choose 2 medium hand tossed pizzas of Rs 305 from Dominos pizza menu and get them for just Rs 199 each. The coupon code is not required to grab this offer price. Choose from menu available at Dominos and get huge savings on your all online orders. Here you can also avail buy 1 get 1 free Friday Dominos offer. Order now! Make a saving of Rs. 141. With Dominos, get best discounts on pizzas. Buy here for chef's chicken choice pizza and get best price. This pizza is available in crusts like classic hand tossed, wheat thin crust, cheese burst and more. Choose one and place an order with Dominos with best discount price. Also get Friday Dominos offer at best discount prices. Rs. 101 OFF on minimum order value of Rs 400. Use the valid code now. Applicable on order value of Rs 350. Minimum order value should be Rs 350. Veg Single Pizza mania Combo. Get flat 10% supercash on your online pizza orders. Flat 10% SuperCash while doing payment through Mobikwik wallet. Up to Rs 75 Supercash on your online orders. Get regular Paneer & Onion pizza for just Rs 155, medium Paneer & Onion pizza for just Rs 295, large Paneer & Onion pizza for just Rs 445. Dominos Friday Offer of buy 1 get 1 free online. On first transaction you will get Rs 100 and on second transaction you will get Rs 50. Get FLAT 30% OFF on order of Rs 350. This is Not Valid on Simply Veg/Non-Veg, Stuffed Garlic Bread, Beverages and Combos. Get 25% cashback by paying through MobiKwik wallet. Order Now to get this huge discount. Order Pizza to get a free coke Now. Get Flat 50% OFF on your order of Rs 300 and above at Dominos Happy Hours Sale. valid on all orders made between 11 AM and 5 PM. Use given promo code to avail 50% OFF. In case, if you wish to order after 5 p.m., you will get a Free Garlic Bread and Dip Free on Rs 350. Use this code - NET09 to avail Bread and Dip Free. Get 15% Cashback by Using MOBIDOM at Mobikwik Payment Page. Maximum Cashback is Rs 75 and will be Credited within 24 Hrs. Hurry up! This is Valid for Kotak Bank Users only. Domino’s keeps coming up with amazing offers and discounts which you can’t simply resist or ignore! Offers like get one off with one pizza is hardly you can ignore, moreover on a Friday night! 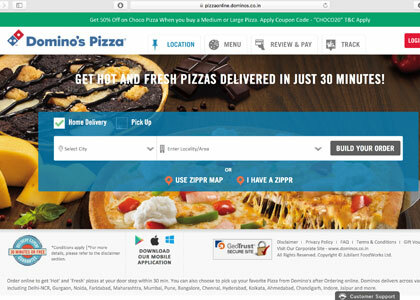 Find Dominos pizza India codes, all the latest offers, today’s deals, Dominos Wednesday offer and Friday offer such as buy 1 get 1 pizza free and much more. HappySale provides all kinds of offers at one place. You can order your favorite hot and fresh Pizza at an amazing price. Avail the best cashback offers while logging in to Happysale or Domino’s pizza website. Domino’s pizza is one of the fastest growing pizza restaurants in India. They are backed by Jubilant FoodWorks, which has a vast network of 1004 Domino’s restaurants located across 230 cities in the country. With its slogan “Yeh Hai Rishton Ka Time”, this brand aims to deliver hot, tasty and freshly made pizzas to its wide range of users for any occasion, delivering smiles. It has over 9000 restaurants worldwide and its headquarters in Michigan. The brand is known for its mouth-watering pizzas and amazing popularity which it has garnered over other brands.The availability of Domino’s online means a lot, for many office goers and people who have tight work schedule with no time to cook. It means the food is just a click away. Hot, creamy, cheesy and crisp pizzas at your doorstep within 30 minutes of placing the order. Everyone knows about the taste of these delicious pizzas and there is nothing new to say about it. And they are much nutritious as the pizzas are loaded with loads of veggies, seasonings, meat, etc. Some people are crazy about this delicious food that they can have it for breakfast or lunch or dinner or throughout the day. And Dominos is there to make your every meal delicious and healthy day by day. Even ordering such yummy dish is not difficult, you just have to select from a varied variety of pizzas and order it from the comfort of your couch. You just need to swipe your card or even place a cash on the delivery order. Whether its on-time delivery or the pizza itself Domino’s will never disappoint you. Its the most cost effective ready-made meal that you can have quickly. You can also order your favorite pasta, chicken wings and beverages to complete the wholesome combo. You can cancel the order by calling up the customer care executive, though the company has its own return and cancellation policy which you can refer on the website. There are certain terms and conditions which you must go through as a customer. Dominos JioMoney wallet offers brings you 20% cashback when the payment is through JioMoney. Do remember to make your Dominos payment with the Freecharge wallet to avail the whopping discount of 25% off on your orders. Dominos and ICICI wallet makes your tummy kush! Pay through ICICI bank pockets and avail 20% cashback on Dominos orders. Apart from ICICI, other bank offers from HDFC, SBI buddy, Citi Bank makes all your order pocket-friendly.